Exactly 2 years ago, I hired a sleep consultant to help James sleep at night. I had already lived through 3 years of sleeplessness with Nora, and I wasn’t willing to wait that long for James to finally learn how to sleep. 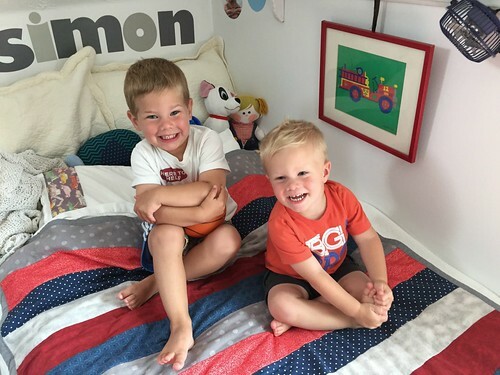 After 2 weeks of working with the sleep consultant, we had James sleeping much better at night, AND we had a new and improved, amazingly awesome bedtime routine for Nora and Simon. 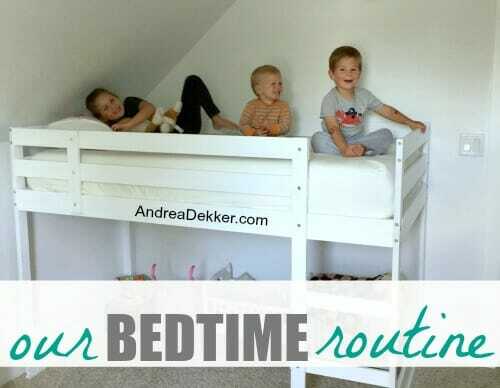 Since then, we have tweaked this bedtime routine slightly as the kids have gotten older, but I’m ecstatic to say that we have been rocking this same basic bedtime routine for 2 years now, and all 3 of our older children sleep fabulously well at night! Of course, there are always exceptions to the rule, kids get sick, they have bad dreams, they can’t sleep for whatever reason, but for the majority of the past 2 years, the boys sleep 12 hours at night (with a 1-hour nap during the day) and Nora sleeps 11ish hours — seriously, I never thought I’d see the day when Nora slept well at night! Since Dave and I both do quite a bit of work in the evening, getting our kids to be early and with a regular routine gives us such a huge sense of satisfaction, and creates a much more positive environment in our house — both because Dave and I have plenty of “down time” at night, and because our children are well-rested each day. Today, I’m sharing what our children’s bedtime routine looks right now — not because I think everyone should use our routine, but simply because I get asked about our bedtime routine quite often, and I know it’s always interesting to read what works for other families! Everyone starts to pick up the entire house — all toys, games, books, dress-up clothes, crafts, projects, etc. The 3 older kids pick out their clothes for the next day and bring them to the living room (Nora puts her clothes in the bathroom). Dave starts a bath for the boys, Nora gets in the shower. Dave finishes picking up the upstairs while I finish cleaning up the main floor, pack lunches, and start the dishwasher. I give Clara a quick bath while the boys are still in the tub, put her PJs on, and get snacks out for the older kids. Nora finishes her shower and gets her PJs on while Dave gets the boys’ PJs on. Everyone meets in the living room for snacks and stories. NOTE: I realize 6pm might sound ridiculously early to start the bedtime process, BUT Dave gets home from school around 3:30 every day and we eat dinner around 4:30/4:45 every day — so it’s really not difficult to start the bedtime process at 6. Also, our kids wake up fairly early and Nora needs to be up by 6:30 to get on the bus just after 7:00. We do try to push back the bedtime process a bit in the summer, but 98% of the time, we really do start the bedtime process at 6pm every night. I usually feed Clara at this time too. 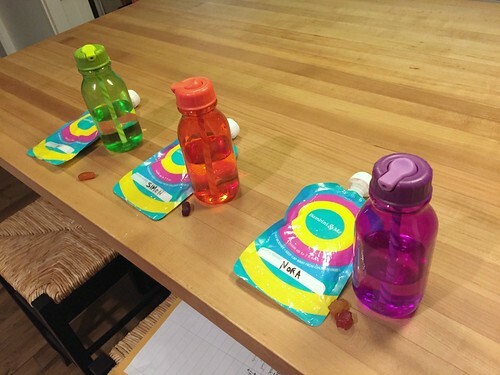 NOTE: I’m often asked what we give our children for bedtime snacks… Sometimes I just decide for them, but often, we let them choose between a bowl of grapes + a couple slices of cheese, a banana, string cheese, or yogurt pouches (I make them myself using these pouches). These snack options are all fairly mess-free, so the kids can eat in the living room while we read books. Also, they are all somewhat filling and they don’t get a bunch of junk stuck in the kids’ teeth! The kids tell us what they want before starting their baths and I get it ready while they are washing up. After 15-20 minutes of reading books, the kids head upstairs. We give kisses and hugs and get them tucked into bed. Dave takes Clara downstairs and I sing a handful of songs with the older 3. The lights are usually off by 7:00 pm, and the kids are usually sleeping by 7:15 every night! NOTE: I should mention that the older 3 kids ALL share a bedroom now. It’s sort of a long story, but it seems to work well for us right now. I’m planning to share an updated tour of their bedroom next week! 7:00 – Hang out with Clara and tackle our to-do lists! Dave grades papers, plans lessons, and gets everything ready for the next day. He often cleans out the dishwasher, washes dishes, gets the mail, takes out the trash, shovels snow, mows the lawn, etc. during these evening hours. I use this time to tackle most of my blogging and VA work (when Clara lets me). I also do laundry or other quiet household chores, bake, prepare food for the next day, run errands, and do yard work during these evening hours. Clara is starting to go to bed earlier — yay! Once she’s sleeping (usually between 8pm and 10pm) Dave and I take showers and get ready for bed. We usually try to be in bed by 11:00pm, but as I mentioned the last month, I often stay up late 1 night a week to finish my to-dos after Clara is finally sleeping. NOTE: last month, we started letting Nora stay up about 30-45 minutes later than the boys when she doesn’t have school the next day. She can play games with us, read a few more books, or work on a craft project. The kids are awake again by 7:00 am (often earlier) and we start all over again! If we’re in a hurry or get home late, we occasionally skip the bath process and just read a few books while eating snacks and head right to bed. However, for the most part, our kids are bathed, dressed, fed, and in bed by 7pm every single night! I realize that by the time Clara is fully on-board with the earlier bedtime routine, Nora will probably be old enough that she won’t need as much sleep — but for the time being, Dave and I thoroughly enjoy the fact that our house is usually quiet and big-kid-free for 3-4 hours every evening! Rule of thumb. Dinner should be 2 hours before desired bedtime. For example, if you want a 7:30 bedtime then dinner needs to be at 5:30. It just takes that long! Here is the book that helped me with my four (now grown) children. wow — thanks so much for this resource Sharon! And yes, that’s one of the reasons we eat dinner at 4:30 almost every single day! By the time we finish eating, cleaning up the kitchen pack lunches and get everything ready for the next day, it’s already after 6:00 and time to start the bedtime process! 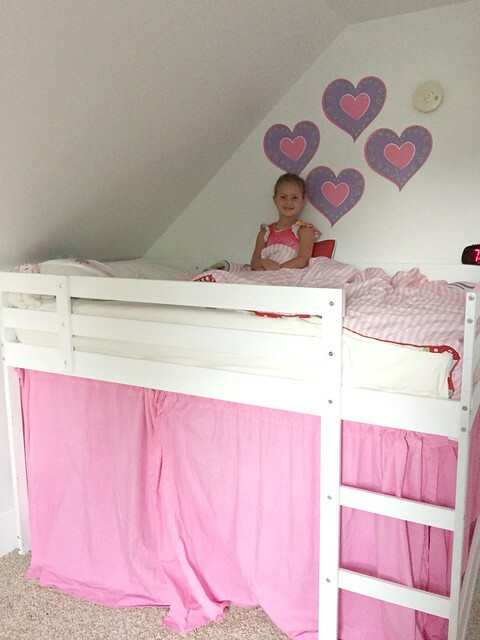 Our kids are almost always all IN BED by 7:00 — sometimes Clara goes to bed at 6:30! It’s still crazy to think how early this is — and it definitely means we can’t participate in many evening activities, but it’s worth it for our family right now. Eventually, as they get older, we can start doing more things at night… but for now, Dave and I will just enjoy our quiet evenings at home while the kids are sleeping! LOL this post definitely stresses me and makes me kind of jealous. I don’t get off work till 5 and my husband picks up the kids from daycare so he’s not home till 6:00 p.m. at the earliest. I’d love to have my kids in bed by 7:30, I’d even take 8. But homework for the kids takes an hour, making dinner, bath times, stories times, it seems like the best we can do is get the kids in bed by 9 p.m. and then I’m exhausted. And even with a late night time, the kids still seem to be up at 7 and on weekends too. A little later would be nice. I’m not sure how you get so many done so quickly. We only have 2, but we both work full time jobs and my husband works in a city that is 30 minutes away so the commute time all drives me crazy. Not sure if you have any tips on short-cuts for us. well, considering your kids don’t even get home until 6:00, I really don’t think theres any way you could get them to bed before 8:00 or 8:30 — so it sounds like you’re doing pretty well. You could always skip baths for a night or so to speed up the process — just do homework, have a snack, and go to bed. just a though — obviously it wouldn’t work for every night — but maybe Mon, Wed, and Fri nights. Routine is so important for kids and to help avoid the tantrums of not wanting to go to bed. I don’t know why others wouldn’t use a routine for their kids. I agree. Even though my kids do go to sleep later they definitely do better when we stick to the routine both at bed time and in the morning when they wake up. I have a 21 and 17 year old. I cannot think of a time in their entire lives when they slept 12 hours at time! I think my 17 year old was probably closer to that, but my older daughter has simply never needed that much sleep. But the sleeping pattern is oh, so important. It helps the entire family. I’m so glad you guys have something that is working! We always joke that sleep will be our #1 parent achievement! Our babies sleep in their own room and crib and are sleep trained by age one. After that, until roughly 2nd grade, bedtime is 7:00. Our 6 kids are 4-14 so it’s a lot different now with later bedtimes and teens and tweens who can stay up later but for many years we had the evenings all to ourselves. And, the kids have always slept through the night at every age. We’ve had some issues with early rising but it’s usually a phase. haha — I know! It really is true though — if your kids sleep well, you are happier and more rested, which means you have more time and energy for your kids the next day — which means they are happier and the cycle continues. Sleep deprivation really is torture! Great job!! I may start snack and books here too! My kids are spread about like Nora and Clara and they both have the same bedtime still. 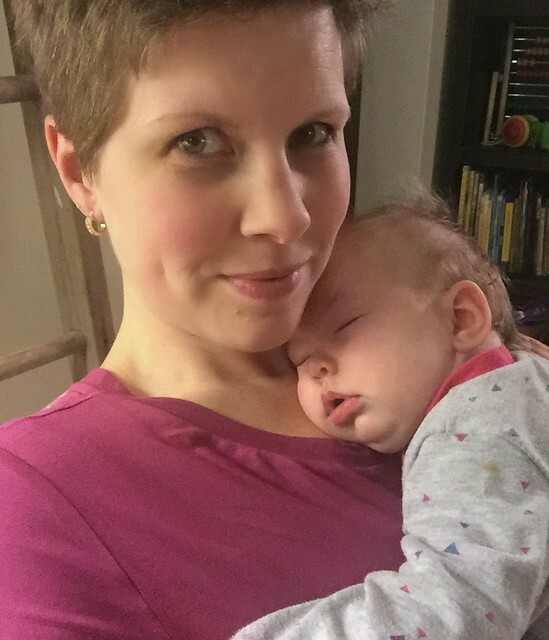 My oldest really needs enough sleep to be her best – but even if she didn’t, she’s still growing and needs rest! I read your post on the sleep consultant and I feel like she was just someone for you to bounce ideas off of during a desperate time? Because I feel like your lifestyle (consistent and routines based) is already highly conducive to good sleepers. Your kids sound like they are good sleepers, sure they had some bumps in the road, but it sounds like normal stuff, no? I read so much all over the internet about night routines and sleep consultants and I wonder if I’m missing something but would like to understand? Is there a reason why so many kids have sleep issues? Adults themselves have so many issues and bad habits that I feel like they pass onto their kids! I think the lack of sleep for both Nora and James was SO disruptive for our family because Dave and I are naturally so scheduled. It boggled our minds how hard it was to get them on any type of sleeping schedule and get them to sleep through the night. Simon and Clara have been so easy — maybe that’s how your children were/are too. If you ever have a Nora, you’ll know why people hire sleep consultants! 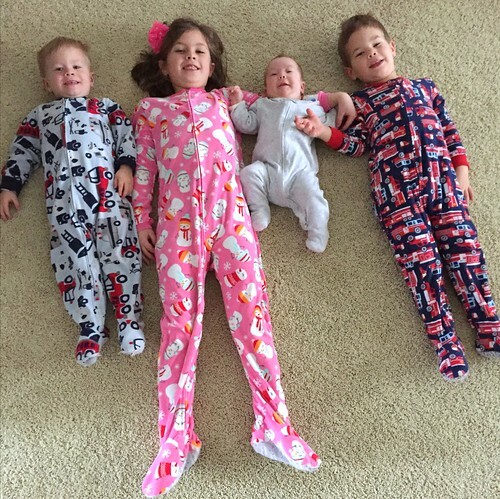 I totally understand about the sleep deprivation and can only imagine what you went through with Nora… in the first year with my twins, I slept so little, I went through hallucinations and sometimes didn’t know what was real or not! haha — wow twins. You are amazing! I guess we didn’t “have” to hire someone, I just knew I didn’t want to live through 3 years of sleeplessness like I did with Nora so I felt liked I had to do something… and that was the first option we tried. Thankfully, it worked and we’ve been enjoying good sleep for the past 2 years! I think life with little kids is so crazy — even the most scheduled and organized people can be completely thrown off guard. There is still hope for all parents out there! Love it. Kids crave consistency! yes! And so do their parents 🙂 Dave and I work well with routine! Does Nora go to bed with a wet head every night? Sleep begets sleep! We do early bedtime, too – I start the baby (4.5 months) around 5:30 and he’s asleep by 6. Our 2 year old is usually in bed by 7 – earlier if he skips a nap! wow — that’s amazing! Clara cat-naps all day long and doesn’t usually go down for the night until 8 or 9pm. I don’t care too much though — as long as she keeps sleeping through the night for me! I have six kids, from 20 months up to 9 years old, and they all go to bed at 7 and get up at 6. I didn’t think we’d still be able to get them to bed that early at the older ages, but they are noticably tired and cranky when they go to bed late for some reason! I should note that they also have a 1 1/2 – 2 hour “rest time” every day, too. Years ago, I heard the phrase, “sleep begets sleep”; as in, well rested kids sleep better. I have found that to be so true in our family! Unfortunately, my husband has to get up super early (3am!) for work, so we have to go to bed early and don’t usually get to take advantage of the quiet evening hours, but it’s still so nice to have the kids in bed early and at least get a bit of quiet time before we go to bed. Anyway, I just wanted to encourage you to not feel the need to change your older kids’ bedtime too soon unless you want to or it becomes apparent that you need to! Love that the kids are in bed early. Not sure how you mow the lawn and do yard work in the evening—-isn’t it dark? Love your posts! haha — not in the summer! It’s light until 10:30 in the summer — and when the kids go to bed at 7, we have 3 hours to work outside! It’s glorious! 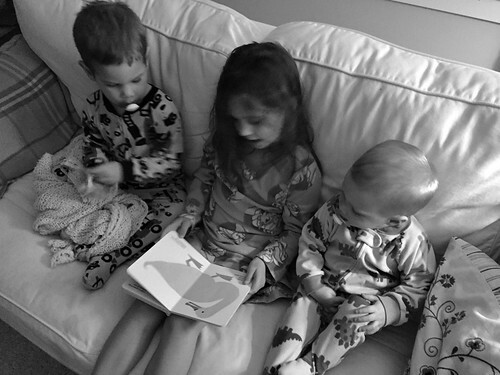 My kids (now 25, 22, 20, 18) all went to bed EARLY! I remember putting our oldest daughter down at 5:30 sometimes, and she slept until 6 a.m. without fail! I decided that I would rather have my evenings than my mornings. I don’t sleep in and it didn’t matter to me that the kids were up early. Some friends were horrified (they preferred sleeping in), but it worked for us. And kids who go to bed at 10 p.m. and sleep until 10 a.m. are awfully hard to retrain when school starts at 7:45! Also, cut yourself some slack–there are NO “super parents”! LOL!